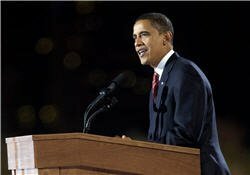 Now that Barack Obama has won the US presidential election we look at his blueprint for change in the technology sector. Broadband access for all of America. Connect schools, hospitals and libraries. Educate the next generation of scientists and engineers. Electronic medical records that will reduce error, improve healthcare and lower costs. Comment on legislation before it is signed. Make research and development tax credit permanent. Online accesss to government data. Enable tracking of federal contracts, earmarks and lobbying contracts.